Brillonline.nl has become Brillonline.com. The page you were looking for has moved. Please adjust your settings. The Encyclopedia of Women and Islamic Cultures Online is an interdisciplinary, trans-historical, and global project embracing women and Islamic cultures in every region where there have been significant Muslim populations. It aims to cover every topic for which there is significant research, examining these regions from the period just before the rise of Islam to the present. The Encyclopedia of Women and Islamic Cultures Online crosses history, geographic borders and disciplines to create a groundbreaking reference work reflecting the very latest research on gender studies and the Islamic world. Suad Joseph, Ph.D., is Distinguished Research Professor, University of California, Davis. Joseph founded the Middle East Research Group in Anthropology precursor to the Middle East Section of the American Anthropological Association; the Association for Middle East Women's Studies; the Arab Families Working Group; a six-university consortium; and the Middle East/South Asia Studies Program at UC Davis. She co-founded the Arab American Studies Association, the Association for Middle East Anthropology; the Women and Gender Studies Program, UC Davis. She was the president of the Middle East Studies Association. She was awarded the UC Davis Prize for Undergraduate Teaching and Research and lifetime achievement awards by the Association for Middle East Women's Studies and the Middle East Section of the American Anthropological Association. Sarah Gualtieri, Ph.D., is Associate Professor in the Departments of History and American Studies and Ethnicity, and former Director of the Middle East Studies Program at the University of Southern California. Trained at McGill University and at the University of Chicago, she has travelled extensively in the Middle East and lived for two years in Damascus, Syria. Gualtieri's publications include a number of articles as well as her book, Between Arab and White: Race and Ethnicity in the Early Syrian American Diaspora (University of California Press, 2009). She is the recipient of several major fellowships, including from the National Endowment for the Humanities, and the Social Science Research Council. Kathryn Robinson, Ph.D., is Emeritus Professor of Anthropology in the College of Asia and the Pacific at Australian National University. Her principal research is in Indonesia, focusing on everyday Islam, gender relations, youth transitions to adulthood, marriage migration, and social issues of mining. Her publications include Gender, Islam and Democracy in Indonesia (2009), Stepchildren of Progress: The Political Economy of Development in an Indonesian Mining Town (1986) and several edited volumes including Youth Identities and Social Transformations in Modern Indonesia (2015). She was founding editor of The Asia Pacific Journal of Anthropology, and president of the Asian Studies Association of Australia (2009–10). For more info, please visit Professor Robinson's staff profile. Elora Shehabuddin, Ph.D., is Associate Professor of Humanities and Political Science at Rice University. She received her A.B. in Social Studies from Harvard University and Ph.D. in Politics from Princeton University. She is the author of two books, Reshaping the Holy: Democracy, Development, and Muslim Women in Bangladesh (Columbia UP, 2008) and Empowering Rural Women: The Impact of Grameen Bank in Bangladesh (Grameen Bank, 1992) as well as numerous articles. She has received many fellowships, including being selected as a Carnegie Scholar and as a Research Associate in the Women's Studies in Religion Program at the Divinity School at Harvard University. Zeina Zaatari, Ph.D., is an independent consultant, university lecturer, and research design trainer focusing on gender and sexuality in the MENA. Her recent publications include: “Social Movements and Revolution,” in A Companion to the Anthropology of the Middle East; “Desirable Masculinity/Femininity and Nostalgia of the “Anti-Modernity”: Bab el-Hara Television Series as a Site of Production,“ in Sexuality and Culture; and “Re-imagining Family, Gender, and Sexuality: Feminist and LGBT Activism in the Context of the 2006 Invasion of Lebanon“ (co-author Nadine Naber) in Cultural Dynamics. Zeina is the Secretary of the Board of the Association for Women's Rights in Development and a member of the Arab Families Working Group. For more info, please visit https://independent.academia.edu/ZeinaZaatari. Supplement 14. Pauline Homsi Vinson, Ph.D., is adjunct professor of English at Diablo Valley College, California. Pauline's doctorate centered on English Renaissance drama and her current work focuses on gender, race, and representation in Arab American literature, cross-cultural portability, and cosmopolitanism. She has taught in the U.S., the Middle East, and Southeast Asia. Pauline is co-founder and former secretary of the Arab American Studies Association and 2016 chair and co-founder of the Global Arab and Arab American Literature forum at the MLA. She has published encyclopedia entries, book chapters, and refereed articles on Arab women's autobiographies and Arab American literature. Her current project explores the subversive potential of storytelling in Arab American re-configurations of the 1001 Nights. Nutrition and Dietary Practices: Central AsiaSee Figures 15—16. Print EWIC Volumes I–VI were published between 2003–2007. EWIC Online launched in 2010. All articles from Print EWIC are published in EWIC Online. Articles from Print EWIC indicate the volume in which they were originally published with the label “Volume X”. The date of publication “first published online” for all articles in EWIC Online, however, is the date of upload to EWIC Online. 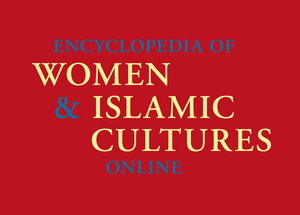 For the date of original publication of Print EWIC articles, kindly refer to the publication date of each volume, found on http://sjoseph.ucdavis.edu/ewic or http://www.brill.com/publications/encyclopedia-women-islamic-cultures.